You can't talk about beer in St. Louis without bringing up Anheuser-Busch. The world-famous brewery has been a part of the city's landscape since 1852. The best way to learn about Anheuser-Busch and its beer-making process is by taking a free tour of the A-B Brewery in Soulard, just south of Downtown St. Louis. For the tours, go to the entrance at 12th and Lynch streets. This is a walking tour so make sure to wear comfortable, closed-toe shoes. Part of the tour goes outside, so dress for the weather as well. Children are welcome on the tour, but the brewery is not easily stroller accessible. Children will likely have to walk or be carried during parts of the tour. Fridays and weekends are the busiest times for tours. For smaller crowds, plan to visit on a weekday. Registration is not required to take a tour unless you are bringing a large group of 15 or more. The tour lasts for a little more than an hour. It ends with free beer samples and soda for those younger than 21. There are three main things you'll see on a tour. First is the Budweiser Clydesdales and their stable. The Clydesdales have been the face of the brand since the 1930s. They make hundreds of appearances every year. Then, it's a walk through the brewing and bottling areas to see where Budweiser, Bud Light, and other brands are made. This portion of the tour includes stops in the historic Brew House, the fermentation cellar, and the packaging plant. This is where you'll learn about the history of the company and how it grew into the brewing giant that it is today. Finally, it's a trip to the tasting room for two free samples of A-B products. Soda and snacks are also available. After the tour, you can stop by the gift shop for souvenirs or hit the Biergarten for more food and drinks. 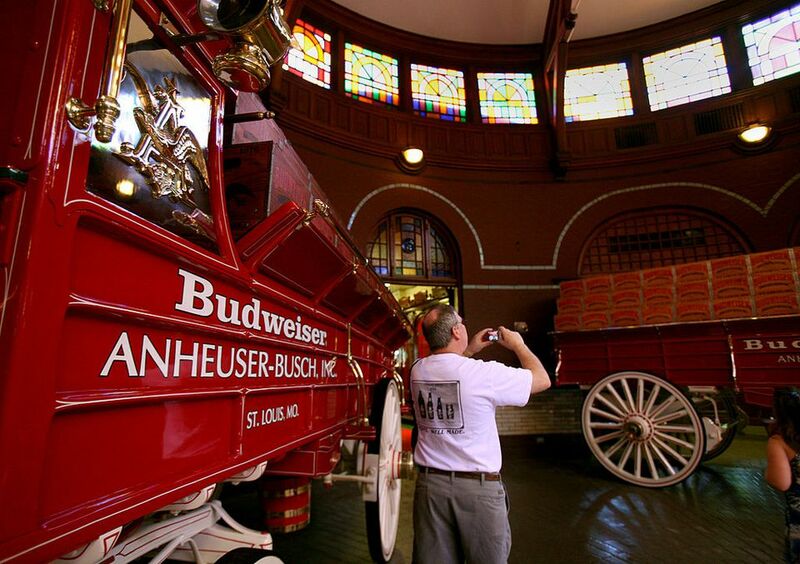 As you might expect, Anheuser-Busch does things in a big way even with its tours. Groups can be quite large, and tours move pretty quickly. There won't be time to stop and chat with the brewmaster about the quality of the hops. If you're looking for a smaller, more personalized brewery tour, try Schlafly Bottleworks, an independent craft beer maker in St. Louis. If you don't mind spending a little money, you can sign up for Beer School before you take a tour. The half-hour class includes tastings, pouring demonstrations, souvenirs, and information about the brewing process. Another option is the Brewmaster Tour, which offers a more in-depth, behind-the-scenes look at brewery operations. The A-B Brewery is easy to get to by car, just off Interstate 55 south of Downtown St. Louis. There is no Metrolink stop nearby, so taking the train is not a good option. MetroBuses do run to Soulard, but with plenty of free parking, the best option for many is to drive. Soulard is a historic neighborhood that hosts a popular Mardi Gras celebration in February and an Oktoberfest party in October. The Soulard Farmers Market also draws crowds year-round, so there's plenty to see and do after your brewery tour if you're visiting at those times. If you're hungry before or after your tour, Soulard has some great restaurants that are worth a try. Barbecue lovers should stop in at Bogarts Smokehouse for its fantastic brisket, pulled pork, and ribs. McGurk's Irish Pub has been a popular destination for decades with its upscale pub grub, cold Guinness, and authentic Irish music. Another good bet is Molly's where you'll find drink specials, a wide variety of bistro fare, and live music.